I forgot about my bike due to the busyness of life. Here in the Bay Area it’s a year-round riding season, but wintertime for me usually brings about less seat time. Because we have the luxury of so many great riding days, it’s easy to skip the ones that are less than perfect. When I hopped on the bike to head to work, my motorcycle expressed some displeasure. What happened? A whole month went by and all the motorcycle heard was silence from me. It’s really actually easy to keep your motorcycle happy over the winter. I just neglected the very basic steps as I’ve usually gotten away with riding it enough to keep it happy. Gasoline and the battery are the two ingredients that give the motorcycle life. Batteries are often overlooked as the motorcycle usually “just works” over a long period of time. When they fail though, they fail hard. When I pressed the starter button all I got was wah, wah, wah. My battery was clearly dead. Batteries discharge over time. Certainly starting the motorcycle takes energy. Also though, batteries discharge when the motorcycle is not running. Batteries stored in a motorcycle will lose energy for things like powering the clock but additionally they lose energy just sitting. It also takes electrical energy from the battery to run the motorcycle. The spark that ignites fuel comes from the electrical system of the motorcycle. When a battery dies, it’s important to understand why it died. Our batteries talk to us. I’ve listed a few simple scenarios below. Today’s motorcycles have a wide variety of electronic components that need to remain in balance. The stator and voltage regulator produce energy. Various components on the motorcycle consume energy including lights, spark plugs, gauges, etc. When we add additional components like heated gear we can sometimes consume more energy than the motorcycle produces. This depletes the battery. Also simple things like leaving our lights on when the bike is off can drain the battery. These one-off cases can be easily remedied by charging the battery with an external charger. You are the cause for failure, not the motorcycle. :-). In my bike I’ve found that a good battery will last me about four years. The current battery I have is a cheap knockoff and only lasted me two years. When buying a battery, spend the money to get a good one. Old batteries do not retain charge. Neither the motorcycle’s charging system or an external charger will help a battery in the state. The battery will discharge when sitting faster and faster as the battery gets older. If the starter sounds more lethargic over time it’s likely your battery is aging and needs to be replaced. Running the motorcycle requires electrical energy. The stator and voltage regulator work together to replenish the battery has the rider rides his bike. The motorcycle produces more electrical energy that is required to run the motorcycle. The excess then replenishes the battery to keep it fully charged.If the charging system is not working properly, the motorcycle will drain the battery as it runs. How far you’ll be able to ride before the battery dies and you get stuck is anyone’s guess. I was riding a rented Harley across north Georgia and the connection between the stator and the battery came loose. Many miles later the bike lost power and came to a soft landing. It was a long walk to get back to town :(. 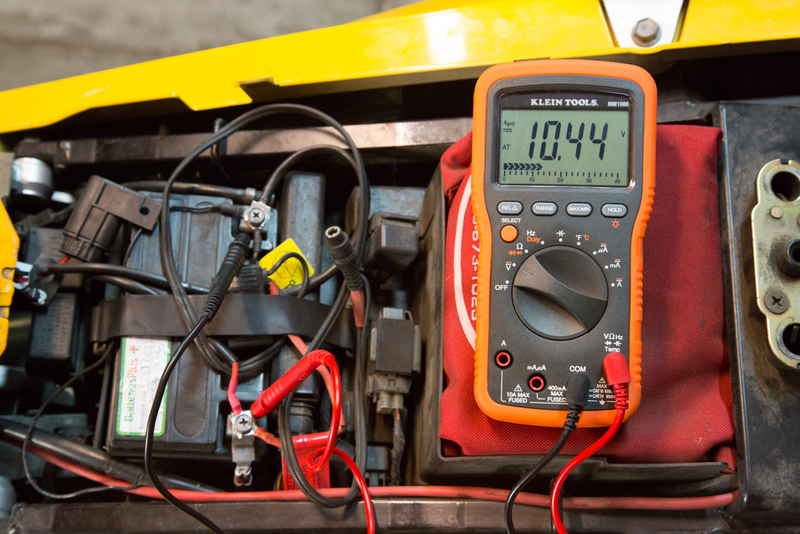 A multimeter can measure the amount of electricity inside of the battery as well as the amount provided to the battery by the motorcycle. I highly recommend any motorcycle rider purchase a multimeter. 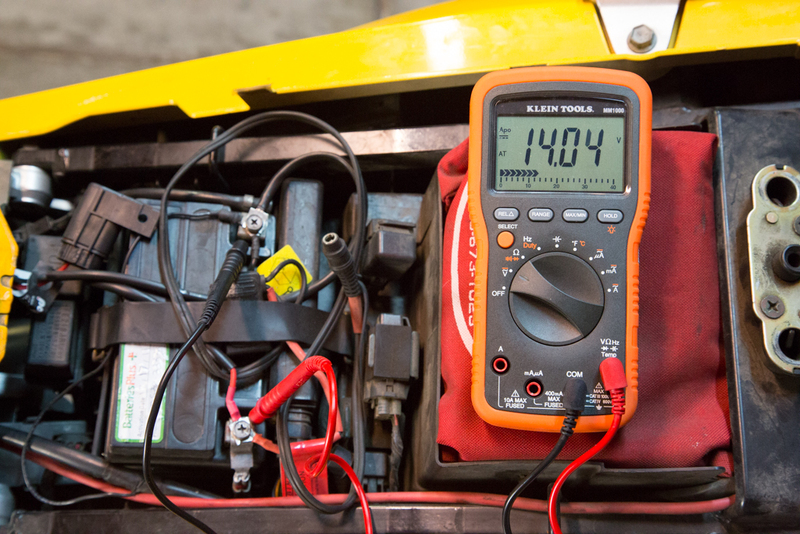 It takes the guesswork out of troubleshooting battery problems. There are two kinds of electrical current: direct an alternating. Direct current comes from batteries like the one in your motorcycle. Alternating current is in your home. Set the multimeter to measure volts in direct current. Look in the upper left-hand corner of the multimeter. You’ll see a flat line under the text “Apo”. This indicates direct-current. If the multimeter was measuring alternating current, the flat line would be replaced by a wave icon. 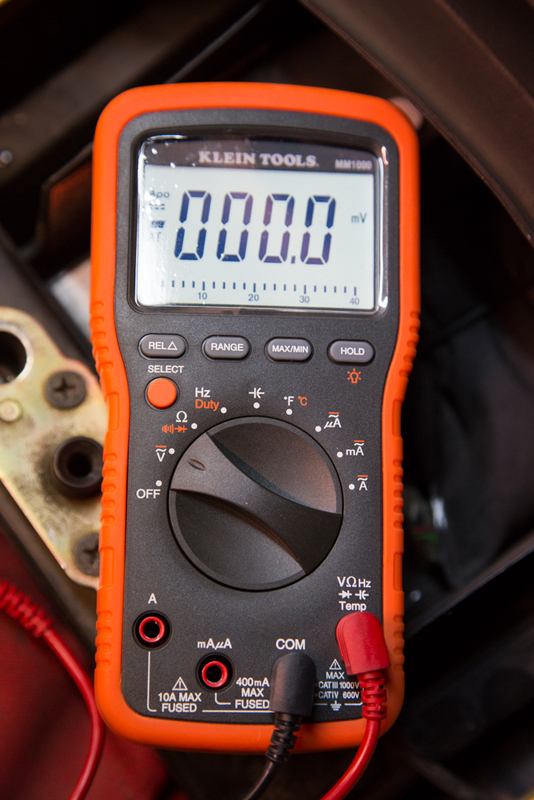 Every multimeter is different, so check the manual for the proper configuration if you’re seeing erratic or no results. With the motorcycle off, touch the black probe on the multimeter to the black terminal on the battery into the same for the positive red probe. A healthy battery should read at least 12 V. You’ll also notice the motorcycle starter sounds chipper. When the battery drops below 12 V, the starter will sound more and more lethargic. We then need to understand why the battery is not at full charge. Let’s start the motorcycle. Activating the motorcycle but not fully starting it places strain on the battery. You’ll likely see a small dip in voltage running across the battery when the motorcycle is on it not running. This battery is getting weak. Thus, the motorcycle is quickly depleting the energy from the battery. Starting the motorcycle kicks in the motorcycle’s charging system. If we run the same test that we did before, we should see about 14 V.
If your motorcycle is not reading more than 13 V, it’s likely that the charging system is not fully up to par. In this case, the motorcycle won’t start after it’s been running. That’s the key symptom to look for: the motorcycle doesn’t start when warm. If you are seeing about 14 V, the charging system is working. If the motorcycle runs fine all day and then doesn’t start well after sitting on the night, the battery is not holding charge. It’s usually the case that the battery is due for replacement. When you buy a new battery, trade in the old battery so that gets recycled and you don’t have to pay an environmental damage fee. Motorcycles are meant to be ridden. Regular use of the motorcycle provides needed exercise to the battery to keep it healthy. Regular use of the motorcycle also keeps you healthy. 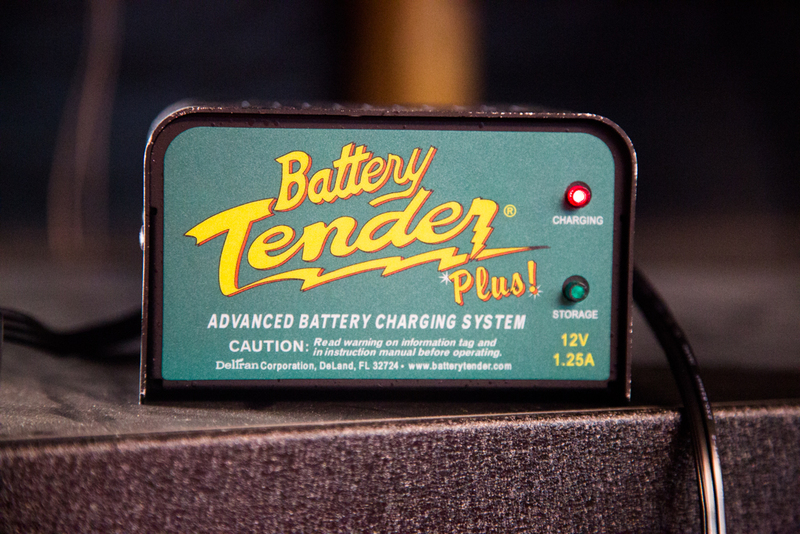 🙂 If you want to riding your motorcycle for an extended period of time, invest in a battery tender. Battery tenders provide a trickle charge and exercise to the battery to keep it healthy. Battery tenders can easily double the life of the battery. This particular model has a few status lights to help you know that your battery is in tip top shape. My battery tender comes with a couple of connectors. Alligator clips work well for infrequent use of the device. I can just pull the seat off and connect the battery tender. When I put the bike into storage this winter, I’ll use the more permanent ring mounts for the battery. You can start a motorcycle a number of ways without a battery. Many riders have “push started” their motorcycles by getting it rolling and dropping it into gear. The spinning of the wheels in gear mimics the action of the starter to get the motorcycle running. If your motorcycle is too heavy or there’s no easy way to push start it, you can also jump start it. It’s ideal to jump start a motorcycle from another motorcycle. Just connect the jumper cables between the two bikes in the following manner. Start the motorcycle with the good battery. It may take a few moments for the motorcycle to accrue enough charge to start. WARNING: if you need to jump start the motorcycle from a car, follow the same steps above but do not start the car. Starting the car will overwhelm the motorcycle’s electrical system and cause serious damage. You are up and riding again but know that your motorcycle needs a new battery. Jump starting is only a temporary solution. Good battery health is a little bit of knowledge, a little bit of storage conditions, and a little bit of luck. Had good luck or been burned by a battery? I’d love to hear your story in the comments. Alex, thank you for sharing your story. It’s awesome to hear knowledge being transferred from father to son. I know for me I learned a number of tricks from my dad along the way! Great read. I’ve recently had some issues with the “batteries” (more than one) in my royal enfield bullet. 2012 out of the box I bought in 2014. The first week I was riding and everything cut out. A crap battery that the shop had to replace. Here I am a year later with a replacement battery. I kept it filled and charged it in late march 2015 at a storage shop. It was running fine until this past week It cut out on me in the middle of an intersection and then I got it started again after a few minutes and ran fine. The next day. It started with no problem, but then was sputtering and stalled a couple times before riding off. Then I just lost all power again while riding. I checked the connections and fuses and they looked fine, but couldn’t get her started again. Note: I live right near NYC and it is continued start and stop with little to no periods of continual 30+ mph riding for a length required to charge. The headlight also stays on as a safety mechanism by the manufacturer. These may be culprits and/or I have a bad regulator that won’t sufficiently charge the battery. I will have to invest in a multi-meter, new battery and charger for the future. Thoughts? I think it’s worth running the same tests I mentioned in the blog. What is the voltage on the bike is sitting? What is the voltage on the bike is running? How does the voltage change if it’s been sitting for a few days or weeks? When the bike is off the battery’s voltage higher or lower after a moderate right? 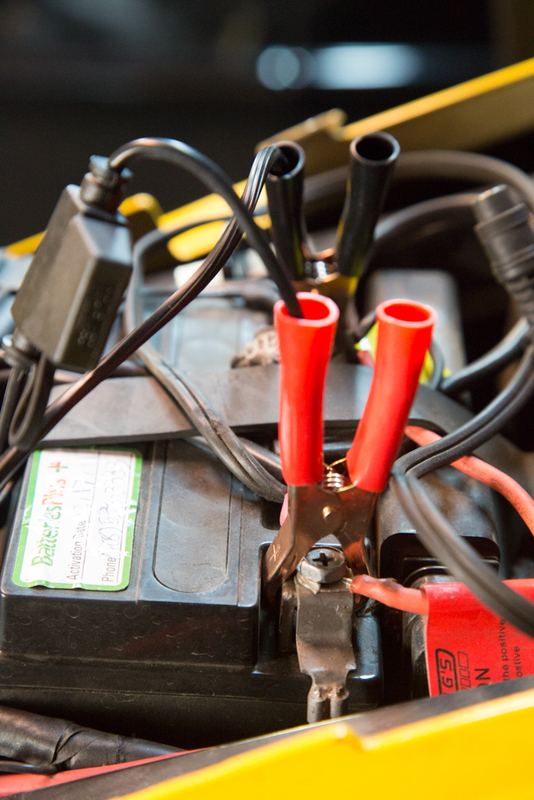 You’ll want to eliminate the fact that this is a battery issue versus some other electrical issue in your motorcycle. Hi great article! I’ve just had to replace my motorcycle battery after 13 years! Can’t believe it lasted that long! It had been kept on a trickle charge when not in use but I think 13 years is still good. Thanks for writing in! 13 years on a single battery is awesome. I usually get about 4 to 5 years of life out of line, but just found the secret of the trickle charger. What kind of bike do you ride? Hi, I ride a Kawasaki ninja 636 (2002 model) I live in the UK and while I’m writing this are halfway thru a 1 week tour round Germany, France, Belgium and Luxembourg. I think the reason which finally killed the battery was that unlike the UK the rest of Europe you have to have your head lights on at all times and the fact I kept stopping and starting to take photos and the addition of a sat nav put to much strain on the poor battery! I’d break it down to it’s component parts: battery, charging system, wiring. Have you measured if the battery is holding charge? When the bike is at idle, is the magneto or alternator adding power back to the batter (with the lights on). If the battery is in the bike does it hold the same amount of charge if the battery is disconnected? Something has to be draining power somewhere… it’s just a matter of finding it. Hi there, now this will test your noodle…so, bike wouldn’t start after not riding for couple of months, I charged it up and worked for two days before it died on me after riding to a friends. Charged it again ,got home and tested the battery, which read 12.4. Charged it over night and tested it and it read 17.4, YES 17.4volts, unbelievable right? I took it off the charger before it could explode obviously and took it for a 20min ride up and down my street like a mad man. I tested the battery again with bike running 14.5, and with bike not running 12.2. I took it for a ride and it died on me on the road, all the electrics just shutdown. I tried to start it up and it sounded dead, I then tested it after going home to get my multimeter and trickle charger and it was 10 or 11 volts with electrics on. I charged it for a while til it read 13.4 and it started up. I rode back home before and it died again on the way. I tested my stator and it has good continuity same with the reg/rect, they are both in good order. My bike is a Gsxr 1000 k3, the battery was about 5 months old be before it lay for the two months. What’s the verdict Doc? Btw my oil is just over full but I doubt that could shutdown a bikes electrics? I don’t think the oil level has anything to do with it. If you’re a smidge over there may be some smoke or oil in the crankcase – but I highly doubt the oil is causing electrical problems. At some level – the electrical system is closed-loop. Running the bike will consume and generate electricity at the same time. If you’re out of balance then problems will ensue. Did you have problems before getting the new battery? If the bike dies when running, it appears that demand for energy is higher than the production of energy pointing to the magneto/alternator and voltage regulator. 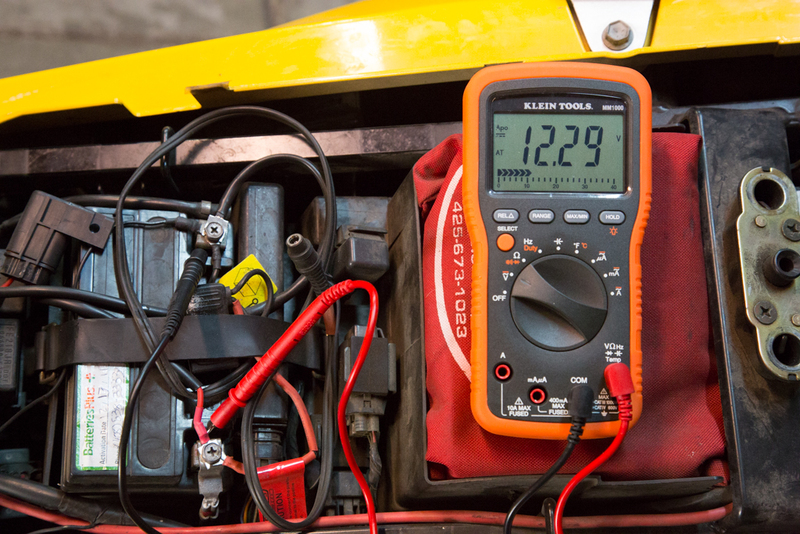 You could always bring the multimeter along and check voltage in/out along the ride. As the RPMs of the bike go up, does the available energy to the battery go down? I have that problem! 14v at battery at idle but as revs increase volts plummet to around 8 to 10. Tried new battery, same issue. Any advice appreciated. Paul – if you ride the bike does the battery lose charge during the ride? If so, I’d tend to think it’s the charging system not providing enough current to run the bike thus depleting the battery. Does the headlight dim as you increase RPM? Wow it’s been awhile…and came across this. So the issue was my reg/rec, it over heated melted and forced the connector out. Any how got the same problem again, I bought a second hand reg/rec and now find it is dying, I’m not sure. I did a continuity test and found one connector is slightly weaker example… 4.3-4.3-4.3-4.1…So, now I will go buy a brand new genuine reg/rec as my uncle (an ex mechanic/rider) told me I should always purchase “GENUINE PARTS”. Moral of the story, ‘don’t go cheap on motorcycle parts’. Appreciate your time Dan, safe riding. Thanks for writing in Jesse. I appreciate it! Good day! Just want to ask if an 11 months old battery should be replaced if it is not functioning properly. I am riding a rks 150 benelli. My battery becomes dead when my bike is not used for a day so i always had to have it charged manually. But but wjen i constantly use my bike, the battery functions well….do i have to replace my battery? Hi don, I’m no expert but it sounds like there is something running your battery down overnight. Do you have an alarm fitted? 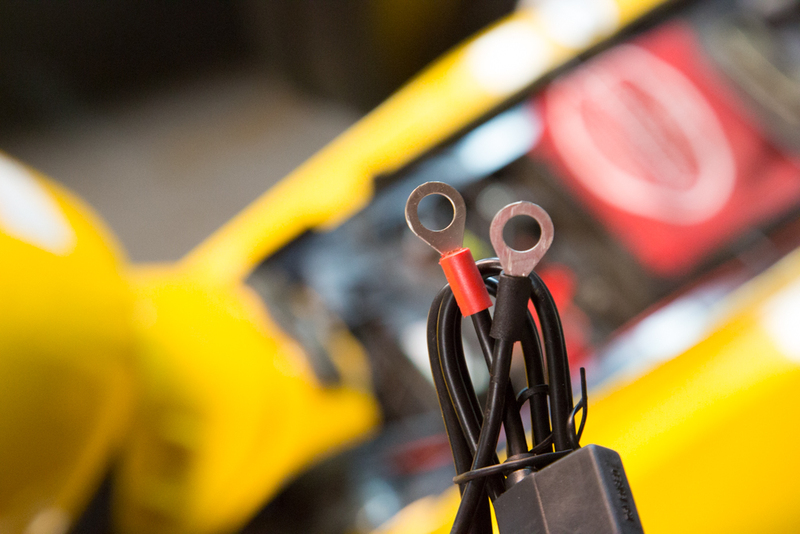 You could get a multimeter and attach the probes to the battery terminals while the engine is not running and see if something is drawing current. Hi just purchased a 05 s50 suzuki took it for test ride no problem, then the next day head light came on but turned the key did not kick over, so took out the battery, no fluid in it, should I buy a new battery? I would, but I’m the type that would rather spend $100 and know I’ve got a good battery than find out after lunch 100 miles away that my luck ran out. Hi, I have a bike that sat for about 2 months and when I tried to started it the battery was dead. I charged it and the bike started up once, but my lights didnt turn on/were extremely weak (tail light and gauges did). The next day I tried to start it up and it wouldnt start. My battery was drained from my lights and alarm possibly as the volts were read under 12. I got a new battery and my bike cranks strong, but won’t start the bike. Could this be bad electrical conmection, charging system, or something else? Thanks! – Does that battery hold charge? – Does the bike charge the battery when it’s running? – Is there another factor preventing the bike from starting (like a fuel issue). If the first two are yes, it points to the third. hi,am shiva ,i have a royal enfield classic 350cc which is 2 years old .My bike’s battery goes down if i do not start it for 2 days …. do i av to change the battery…and one more thing i have given it for recharge but its no use…. 1. Charge the battery when it is not connected to the motorcycle. Place it on a wooden surface. Let it sit for a week. If the battery is dead, it’s time to get a new battery. 2. Charge the battery and connect it to the motorcycle. Let it sit for a week. If the battery is dead, somehow the motorcycle is consuming charge over time. Step one confirmed that the battery is holding charge properly. 3. Charge the battery fully and go riding. If, after an hour or two of riding the battery is not fully charged, something in the motorcycle’s electrical system is not functioning properly to recharge the battery during riding. I would then look at the motorcycle’s ability to generate charge. See the section above that addresses that section. I bought new battery.I tested it and read 12.5volts, as I started my motorcycle engine with full thruotle the battery reads below 13volts. Is my alternator working or my regulator weak? If you take the motorcycle out for a good day ride (three or so hours) what is the charge level of the battery when you get home? If it’s not fully charged – it’s one of the two above. I’m a relatively new rider. I accidentally left my ignition switch on while I was at work for a normal work day (about 8 hours) and I killed the battery. I needed to jump it with my car to get it running. I’ve tried running it on the highway and whatnot but once I turn it off I can’t get it back on. Will a trickle charger save my battery or do I need a new one? Hey Dan! Thanks for writing in. Leaving your ignition on is something we’ve all done at least once in our motorcycle career. Just keep in mind if you do have to jump from a car, don’t start the car while it’s connected to the motorcycle. The car’s charging system will overwhelm the motorcycle when it’s fully powered. My hunch is your battery is probably shot. They don’t like extended periods of time without charge. Try buying a trickle charger first and giving it a shot. If it doesn’t work, buy the battery. Trickle chargers are good to have on hand especially in areas where you’re not riding your motorcycle year-round. Trickle chargers profoundly extend the life of your battery. Hi Dan! It’s very nice that you reply to all the comments on your blog, while not being paid to troubleshoot other people’s bikes. I found your article when having a problem with my 230. Thanks for being a contributor to Internet Knowledge on bikes! yes I have a 98 fzr 600 I just purchased while riding the battery dies and so does the bike I tested the battery with only 11.7 volts in it so I jumped it and made a block the bike died within five minutes I’m figuring stator or recti problems while the bike is running the batt jumped from 11.7 to 12.7 but I’m wondering if a batt sittin at 11 volts while riding will charge still and stay running or not? basicly will a bike with a low battery like mine still run off the charging system once starter? 600 fzr here was showing 11.7 volts at battery when engine isn’t running after starting and reving it only came up to 12.7 when reved would that more then likely need a stator and recti or would it not charge a battery that low? cuz while running only runs a few minutes and bike shuts off and dies cuz of dead battery I’m askin really I guess if the charging system should be strong enough to keep the bike running even with a very low battery? I have a 2008 Harley Davidson Low Boy. Haveing discharge problems, I took a battery reading of 12.6 volts It didnt start the bike. I purchased a new battery, and instaled it on the bike . before I started it I took another reading and it read 12.6 volts. I was surprised. but it started the bike. What is going on? I’m honestly not sure here. First thing that comes to mind was a connection issue that reinstalling a new battery moved things enough that the connection issue is restored. Accidentally forgot to put tender on bike for the winter. Turned on bike and my reading was 8. Obviously bike wont start. IT has now been on tender/charger for 5hrs still will not start and charge is still 8ish my bike is an 07 Harley electric glide. IS my battery pooched forever ? or should I leave it on charger for 24hrs ? I would leave it on the charger little bit longer as long as the health indicator on the charger is positive. If the battery is still not taking charge or the health indicator shows a problem, it’s time for a new battery. Left it on overnite when I woke up green light was shining and bike fired right up. Have taken it out three times with no issues. Thanks for reply. I assumed all was good but once I begin to panic all logic goes out the window. Again thanks cp67. I would keep an eye on your battery. Once it has been catastrophically drained, it’s life does shorten. It may not die tomorrow, but keep your ear out or the starter slowly getting weaker over time. Hi buddy I got a ducati 848 my batt also leave me sometimes stranded …check my rectify all good my stator all good ….put batt on charge it reads 13.4 stray bike up voltage on 14 .1 ride bike for a couple of days say a week or so ….. Then all of a sadden batt dead reads 11.2 … Do u think it could be my alarm ….or mybe something wrong in my charging system….and I got the batt now 11mouths. If you go on a nice long ride, what’s the battery reading at rest after the ride? Is it the same or better than it was before? If you disconnect the battery and wait a week, is the charge still holding? I am facing a little issue with the battery. If i ride my bike on one day it runs fine. But if i leave it for two days without riding then it doesnt start. Also when the bikes warm, like the fans running on ignition again the bike wont start. Is it time for the battery to be replaced or a charging issue?? Unfortunately, you will need to run through the steps in the article to determine the amount of charge supplied by the charging system while the motorcycle is running. Hi Dan. I have my scooter on a tender 24/7, until recently. I had it serviced and since then have not had it on a tender (4 weeks). I installed an alarm yesterday and connected the battery to the tender. Scooter started fine last night. But, this am, I unhooked the tender since it was showing a green light. Shortly after, the alarm would go off sporadically. I tried to start the scooter this afternoon (6 hours off the tender) and it would not start. I attached the tender again, and showed red but within 30 minutes, green flashing. Is my battery dead??? What should I do? Just pulled battery out of an 08 Triumph Scrambler, the original !!! How old is the battery? If it’s in the 4-5 year range – it might be time for a new battery.